Perform Rockwell hardness testing in only 4 seconds with the Versitron Rockwell hardness testing system. 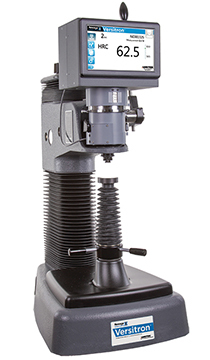 The Versitron Rockwell hardness testing system is a unique and exclusive hardness testing system which provides its users with the benefit of the top-loading and test surface referencing technology. Applying both the pre-load and full load in one test cycle makes it possible to perform a test in as little as 4 seconds! This hardness testing machine is ideal for applications ranging from high volume to sampling, from production floor harsh environments to the lab and from testing awkward shaped parts to precise small part testing applications. The clamping ability is an inherent part of this Rockwell hardness tester and provides the user with the ability to clamp and hold parts in place prior to testing with up to 240 foot pounds (325 Nm). By clamping instead of using jack screws or cutting specimens, the test accuracy is improved and the testing time is decreased. The unique and intelligent indenter shroud secures that the test surface reference is constant and remains unaffected by dirt or foreign objects. The shroud senses the position of the indenter relative to the test surface when the preload has been applied. If the test specimen deflects under major load, the shroud travels with the test surface to compensate by maintaining that precise reference position with the test surface, so the test will remain accurate. A hair under a test block can completely ruin most test results but the Versitron remain accurate. The Versitron hardness tester features a full colour, icon driven display that facilitates easy intuitive navigation. Test results are shown in a large font size making them easy to read. The display is dirt and oil resistant and is easily cleaned. The interface is designed to last in even the harshest environments. The Versitron hardness tester can take on heavy duty work while at the same time offering its users easy access to on-screen test results, such as x-charts, ranges and min/max, during the test. The Versitron is build to last in even the harshest environments. The Versitron hardness testing machine is known as the “Industry Workhorse”, as earlier models have lasted for more than 30 years and is still running smoothly. The Versitron hardness testing system is CE marked and complies with ASTM E-18, DIN, EN, ISO and other applicable standards. Learn more about the Versitron hardness tester for Rockwell testing on www.hardnesstesters.com. Versitron Software Version 1.4 08-Dec-17. Improved the shut down process when the operating system is powered down via mains power instead of through the software. This improvement is only available in machines shipped after December 2017.